You are here: Home » CueSense Private Beta launched! 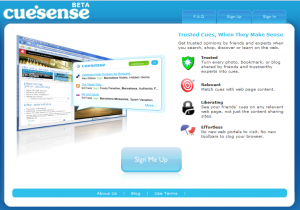 The CueSense Private Beta site is live! This launch represents a significant milestone for us, and we fully intend to celebrate it appropriately. We will be updating the site frequently, listening to your feedback and periodically extending the number of beta accounts available. Our goals for the rest of the year are simple. Learn from users, improve the service, and make it the best it can be. Cheers to that!